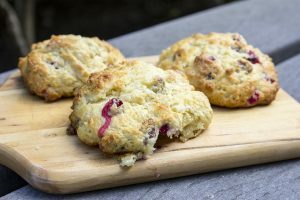 Fresh cranberries add a tart zing to these easy biscuits. The wet dough makes it easy to drop them onto the baking sheet, and eliminates the need for kneading or rolling out the biscuits. Combine flour, baking powder, baking soda, and salt in a large bowl. Add butter and cut into small pieces with pastry blender or rub between your fingers (or use a food processor). Add cranberries and pecans. Whisk yogurt, milk and egg together, then add to dry ingredients and stir with a fork just until blended – do not overmix. Drop dough by heaping spoonfuls (about 1/4 cup) onto greased cookie sheets. Sprinkle tops with additional sugar, if desired. Bake until biscuits are golden brown, about 11 – 13 minutes.